Choose Life coordinator Iain Murray. 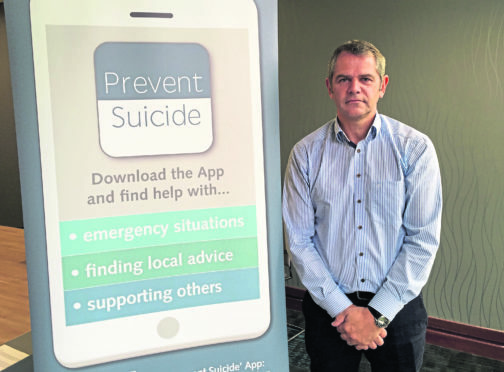 A north-east group set up to tackle the rising number of suicides has revealed that more than 36,000 people have used a new app since it was launched in 2016. Choose Life introduced the app in response to an increasing number of people, particularly men, taking their own lives. The organisation’s coordinator in Aberdeen City and Shire, Iain Murray, told the Press and Journal yesterday that most of the people using the app – 55% of the total number of 36,500 – had been men, which he described as a positive development. However, he acknowledged that, while Christmas is a happy time for many people, it can also be a distressing period for anybody who feels vulnerable or is at risk of social isolation. Mr Murray said: “This is a time when normal work and life patterns are disrupted for a lot of people, whether through holidays, or the pressures of paying for Christmas gifts or organising parties. “We expect to receive more contact in the weeks ahead, but the app is also allowing people to connect with us without feeling they have to speak to us directly. “It has benefited us in that regard, because we know that making that first step to reach out for help can be the most difficult. “Many youngsters can be shy or withdrawn and uncomfortable about one-on-one communication and speaking to people about their personal problems. They prefer to text or use apps or other social media. Inverness actress Karen Gillan recently directed a film “The Party’s Just Beginning” about the subject of suicide. And the issue was given added urgency and poignancy by the death of Frightened Rabbit singer, Scott Hutchison, who killed himself in May. Mr Murray said: “Low mood, anxiety or a sense that we’re struggling to cope can affect anyone at any time irrespective of age, gender or social or economic status. “It’s vital that we seek support as soon as possible and stay alert to these signs in others and respond appropriately. “Simply asking “are you okay?” or reaching out to someone can often make all the difference”. A similar app was recently launched by NHS Highland. If you are worried someone is feeling suicidal, information on what you can do is available by downloading ‘The Art of Conversation’, a free guide on spotting the signs, starting a conversation and being a good listener.